Spirit Airlines will resume flights on Fridays after it reached a deal with its pilots to end their strike. New York (CNN) -- Spirit Airlines reached a tentative agreement with its pilots on Wednesday that will end the five-day-old strike that halted the airline's operations, a union official said. 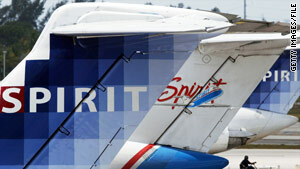 Pilots will return to work and Spirit's operations will resume on Friday, the airline said on its website. "Our pilots worked hard to get a mutually favorable deal that allows the company to grow while improving their wages and benefits," said Ben Baldanza, president and CEO of Spirit. The tentative agreement was reached around 1 p.m. Wednesday, according to Capt. Sean Creed, chairman of the Air Line Pilots Association at Spirit. "It does move closer to the goals that we established for our pilot group and we will move forward with taking it to our pilots for a ratification vote," Creed told CNN. Spirit's 440 pilots walked off the job Saturday morning after an ongoing dispute with the airline over the pilot's pay level. "Our co-pilots were making significantly below the industry standard," Creed explained. The walkout completely grounded the airline. Flights were abruptly cancelled for several days leaving customers scrambling to make other travel arrangements. In effort to make amends with passengers Spirit is offering customers a coupon for $50 off their next flight between June 18 and November 17 and 5,000 free Spirit bonus miles. "We apologize to those customers whose travel was disrupted as a result of the strike and look forward to earning their trust with ultra-low fares, great service and the best pilots in the sky," Baldanza said in a statement.